The Bio-Oil Dry Skin Gel is a pink, jelly-like oil-gel hybrid that’s full of moisturizing ingredients to quench the driest of skin. It’s specifically made for all us dry skin sufferers and really couldn’t come at a more perfect time, as the cold winter weather and hot dry indoor heat has our skin parched for moisture. The Bio-Oil Dry Skin Gel has a truly a unique formula. It has a jelly-like texture that transforms into a dry oil on application. It melts immediately into the skin for a super dose of hydration, and is absorbed quickly just like the classic Bio-Oil skincare oil. When creating this product, researchers examined at the technology used within creams and lotions already on the market and found that these formulas are often made with up to 70% water, which evaporates when applied to skin. So what they’ve done with Bio-Oil Dry Skin Gel is swap out the inactive water content for oil to create a more effective hydrating formula. The result is an ultra-lightweight and fast-absorbing moisturizer. And because it’s 50% Bio-Oil skincare oil , it’s also packed with all the vitamins and minerals you already already know and love. Bio-Oil Dry Skin Gel is suitable for everyday use and can be applied over the entire body. And because its jelly moisturizer formulation a little going a long way, you’ll only need dab to cover a large area. It’s hydrates skin instantly and absorbs into your skin just as quick, which provides instant relief while letting you get on with your life. Economical and effective, it’s already on the road to being the next beauty on cult classic. 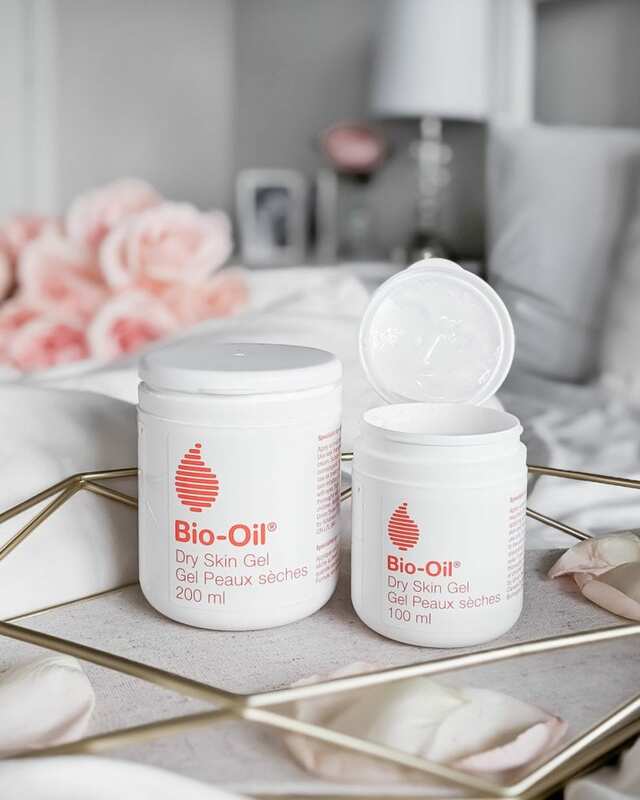 I’m such a huge fan of the original Bio-Oil Skincare Oil (and all ways it could be used for body care, hair, and more), at first I wasn’t sure if the Bio-Oil Dry Skin Gel could live up to its predecessor, but honestly, it exceeded my expectations. I was very intrigue by the unique jelly-like texture. At first touch, I wasn’t sure what to expect, but on contact it becomes a soothing buttery texture that my skin just drinks right up. It was ultra-moisturizing and fast-absorbing as promised, and they weren’t kidding when they said a little bit goes a long way. But best of all, I found it to be super long-lasting. Even hours later my skin was still feeling hydrated, while many of my moisturizers last an hour at best before my skin needs another application. Bio-Oil Dry Skin Gel truly god-sent for dry skin sufferers. I have the worst cracked heels and thought nothing could help them. And only after 5 nights of use, my feet were looking freshly pedi’d. I’ve also been massaging it into my cuticles and my hands have been loving it. What’s The Fuss About Boar Bristle Brushes? "Beauty Essentials: 6 Beauty Tools I Can’t Live Without"
They just released it a couple months ago! It’s everything I love about the original Bio-Oil and more! Just bought this on Amazon. Awesome! Hope you you like it!